The Waterfall Park, located at the Mall of Africa, will soon be home to a magnificent extravaganza of lights, music, exceptional local- and international talent, as well as the best outdoors festive season entertainment ever experienced on South African soil! All dressed up and nowhere to go? 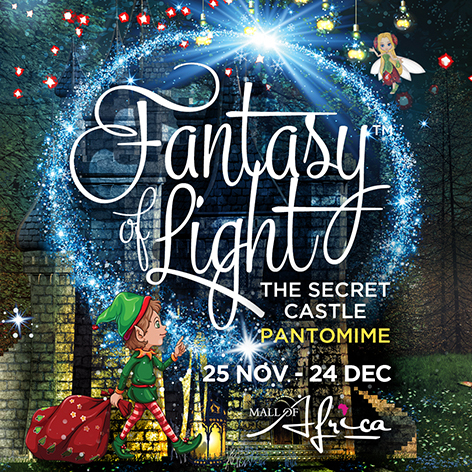 This year, boredom will not reign supreme in the lives of South African families, because from 25 November to 24 December 2016, the amphitheatre at the country’s leading retail giant will be transformed into a spellbinding wonderland of extraordinary lights and visual effects, Christmas decorations, music and an unforgettable stage production that grandparents, parents and cool teenagers will enjoy just as much as the smaller children. A majestic, nine feet high set by Juan Boshoff, 104 colourful costumes, 22 km strings of twinkling fairy lights, a giant stage, 12m of captivating Christmas ornaments with cheerful lighting, a unique 160m waterfall of cascading lights and a world-class concert all contribute towards a dazzling experience like none other before. The ambience set by the original festive music composed by the internationally acclaimed composer, Bernadette Vercellino and music producer Brendan Jury, creates the perfect backdrop to a humoristic fantasy with a gripping storyline and characters that will conquer your heart from the get-go. Outstanding choreography by Weslee Lauder and cheerful outfits by Delene Holt, Heidi du Toit from Hollywood Costumes and Mercedes de Bruyn, gives life to this pantomime-brainchild of one of South Africa’s most famous actresses, Lizz Meiring. She is also the director of this exceptional project, along with producer Rudi Kesting from Production Projects and Juan Boshoff. A very talented cast complements this high-quality production, which will leave audiences wanting for more. This Christmas spectacular offers a fun-fuelled, once in a lifetime experience for young and old. Shows will take place under the starry sky daily from Monday to Sunday. Gates open at 18:00 and by 20:00 the 3 000 guests will be amazed by a 70-minute show, transporting them to a gripping wonderland, where Cirque du Soleil meets Christmas cheer. Tickets can be booked through Computicket at R120 per adult, while kids under eighteen years of age and seniors only pay R80. Secure parking is available and tickets will be exchanged for different dates in the case of unpredictable weather circumstances. Food stalls will be available.